There are several benefits to hiring remote workers. Benefits include flexibility, wider access to global talent, reduced costs, and more. Proximity, however, is not one of those benefits. Rather than calling everyone into a conference room for a quick meeting, you have to rely on technology to bring everyone on your team together…no matter where they are located. Thankfully, there are a handful of smart virtual meeting tools that make communication so easy it doesn’t matter if your employees are in the next room over or halfway across the world. Of course, different companies can benefit from different virtual meeting tools. By the end of this post, you’ll be ready to select a tool that fits with the objectives, goals, and needs of your organization. Zoom brings together cloud video conferencing, group messaging, and online meetings, into one convenient platform. This solution provides top-notch video, audio, and screen-sharing experience across Windows, Mac, iOS, Android, Blackberry, Zoom Rooms, and H.323/SIP room systems. Zoom has been gaining speed recently as one of the most popular virtual meeting software programs. It is easy to use, makes collaboration easy, and offers several different viewing options. Zoom is one of the top-rated tools when it comes to verified customer user reviews. The G2 Crowd rating stands at a 4.5 out of 5 stars as well as does the Capterra reviews. 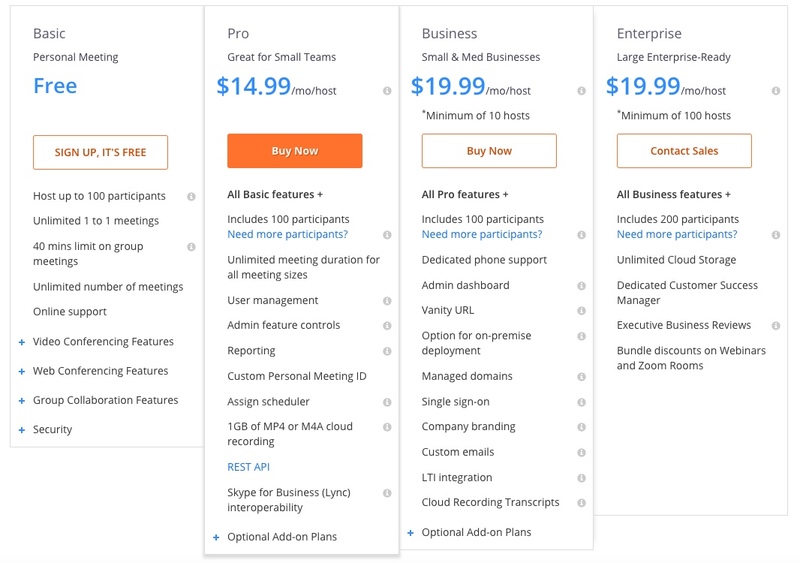 Zoom starts free for the basic plan and can go up to $19.99/month per host for enterprise users. Join.me is another smart way to connect with clients and collaborate with team members. 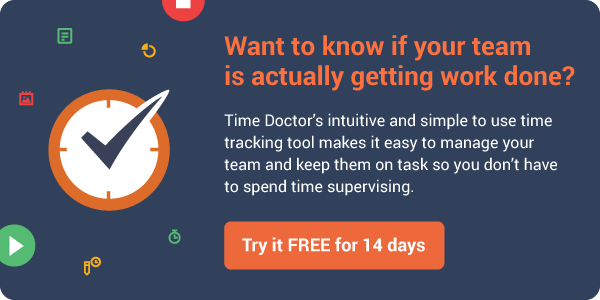 Users of this software can easily share thoughts with video, audio, screen sharing, whiteboard trainings/meetings, participant bubbles, and more. Join.me is a classic way for business leaders, clients, and remote workers to connect with each other in a reliable way. 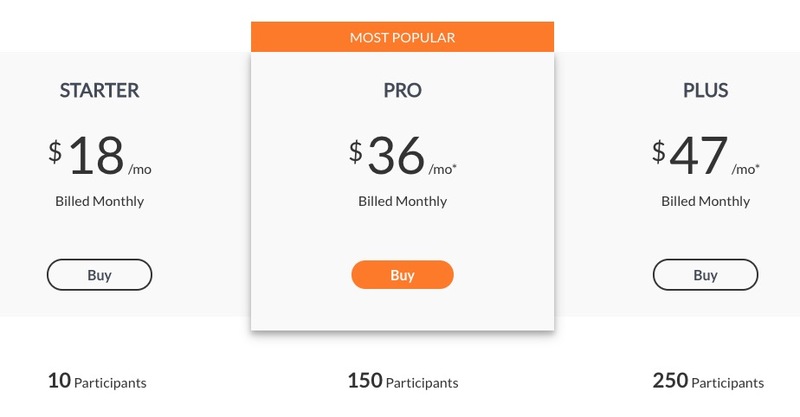 Let’s look at some of the features, benefits, reviews, and the pricing of join.me. Audio Calls – Meetings facilitate high quality audio communication for all parties involved in the call. Scheduling – Scheduling web meetings is streamlined, intuitive, and integrated into the software. Meeting initiation and joining – Starting and joining conferences is easy. Personalized URL – Claim your own personalized URL. Muting – Grant participants the ability to address the meeting and retract when desired. Recording – All conferences can be recorded for future use. Screenshare – Share your desktop screen or an application with the rest of the conference. Follow-Up and Breakout Meetings – Can easily initiate meetings with select participants from the main conference interface. Slideshow – Presenters can cue up a presentation or slideshow for display in the conference. Annotation – Presenters or users can annotate a whiteboard or the presentation. Chat – Conferences include a chat feature. Polling – Presenters can poll the audience with a survey or let them respond with an electronic hand raise. File Share – Allows users to share individual files/folders with users in the conference. Mobile – Offers a mobile app or mobile optimized website to video conference from smartphones or tablets. Security – User authentication and security measures like confidential attendee lists keep conferences private and secure. Customize background – Make your background look however you want with easy customization. Join.me is one of the top-rated tools when it comes to verified customer user reviews. The G2 Crowd rating stands at a 4.1 out of 5 with most participants being especially impressed with the screen share feature. The Capterra rating is 4.5 out of 5. Join.me’s Lite plan is at $10/month. This allows you up to 5 participants per meeting. Business plan is at $30. 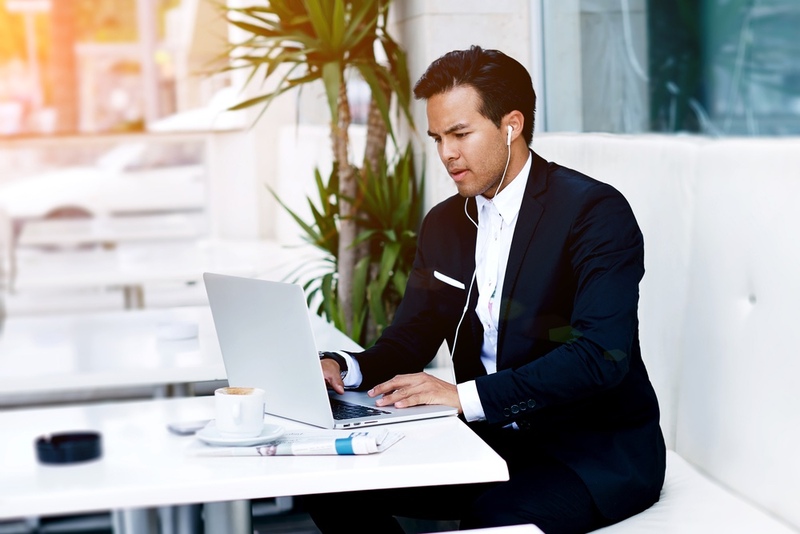 GoToMeeting by LogMeIn makes it easier for people to interact with each other, no matter where they are located in the world. This program is one of the world’s top SaaS companies and supports two million daily users, 200 million customer engagements, and five billion voice minutes per year. 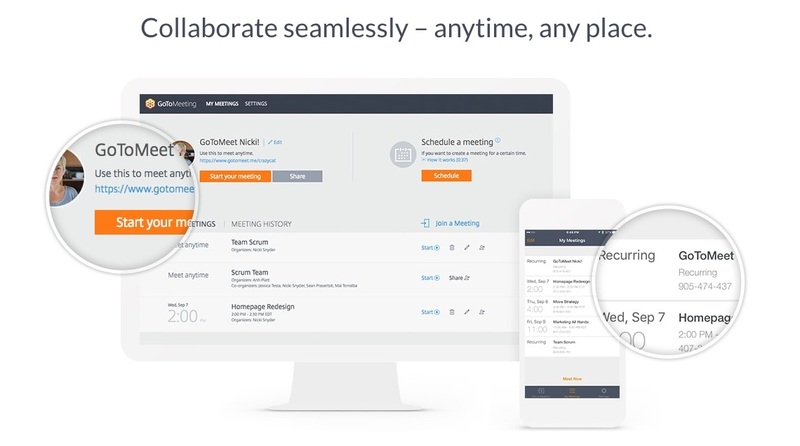 GoToMeeting by LogMeIn makes it possible for remote workers to connect with organizations. It provides flexibility, efficiency, and reliability. Their products are used by professionals and leveraged by small to medium-sized businesses the world. Toll-Free Option – OpenVoice makes setting up toll-free conferencing easy and manageable. GoToMeeting InRoom Link – Bring GoToMeeting into the conference room with built-in support for Lifesize, Cisco and Polycom devices. Now that you know the top features of this program, you may be interested in the extra benefits. These benefits may give you insight into why you may want to select this as your primary method for communicating with remote employees and clients. G2 Crowd rates this software a 4.2 out of 5 with the most popular feature being the “muting” feature. However, most top features are rated at least 83% or higher. Capterra rates GoToMeeting a 4.5 out of 5, and this number is currently based on 2,104 user reviews. 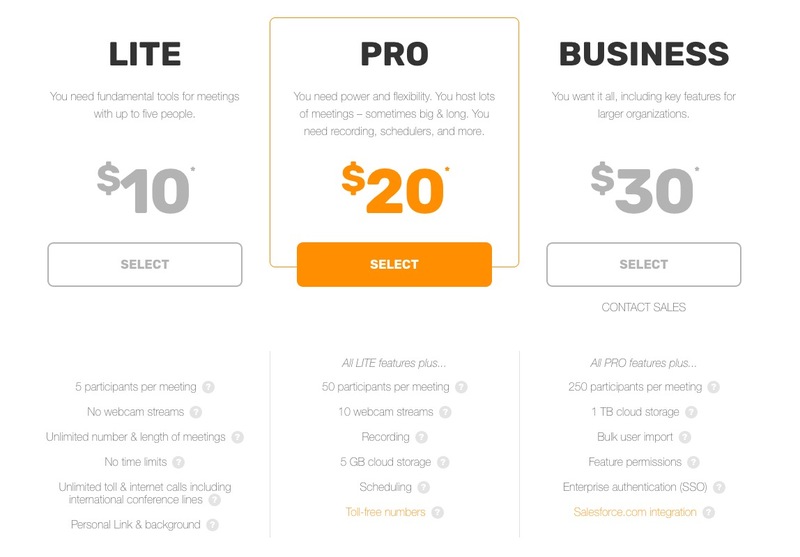 GoToMeeting’s Starter Plan is billed at $18/month for 10 participants. The Plus Plan, gets you up to 250 participants for $47/month. When it comes to finding a software to host virtual meetings, you have several options. However, if you select one of the 3 programs listed above (Zoom, join.me or GoToMeeting), you can’t really go wrong. Of course, each product has different features and benefits. What you end up selecting will depend on your company size, your needs, and the primary reasons you conduct meetings.